Here's one I did today down in an area of Cumberland County known as Potter's Creek. A beautiful little creek, with some outstanding young men as critics and company made the day all the more enjoyable. This size and format was a challenge for me working en plein air. Here is this morning's effort. A much more pleasant, enjoyable experience than yesterday's painting exercise. Here's one that wasn't much fun. I constantly fought a cloud of black gnats that swarmed around my head. UGH! Next time I'll just pack it up instead of dealing with them. If you look close you can see a few embedded in the painting. Serves 'em right! Here's one that got rained out as a plein air on Monday. Luckily I had taken a photo of it before it started raining. So I worked from the pic. I had good intentions of painting today. And even though the sky was partly cloudy, with the sun peeking in and out, I decided to give it a try. I went to the farm of a friend and started to paint an old farmhouse on the property. Well, the sky opened up and I got drenched, even though my vehicle was right next to me; just trying to get all my stuff out of the rain. I waited a few minutes, the rain stopped, I set back up, got a couple of strokes laid, and it started again. So I gave up on that location for the day. After I got back home, the rain ended, and I painted some flowers in my backyard. I have no idea what they're called. Did this plein air this afternoon in my backyard, looking toward my neighbor's shed. Did this one in the Little Renox area of Cumberland County, Kentucky early this afternoon. Had fun except for the ticks. I painted this one on my lunch break today. Grabbed a slice of cold pizza and headed off to Salem Park, about 3 miles outside of town. This creek was rolling with water about a week ago. Amazing how fast things change. Dry as a bone in this area of the creek now. The limestone bottom always gives me fits when there's no water to hide it. Even though it was noon when I started this, the overhangning canopy of trees added a adappled effect I found pleasing. Hope it came across. I did this one this afternoon in Waterview, Kentucky. Here's this afternoon's effort at plein air painting. I call it "Leftovers" due to the hay that didn't get rolled. Liked it as a lead-in to the painting. Had that late afternoon sun that we all love so much. Tried not to over work it, hoping some color notes would get the feeling across. Did this one down in a familiar creek today. Bright sun coming through. Can't believe I haven't seen a snake in this creek yet this year. I started the painting, didn't like the composition after about 10 minutes work, so I wiped it and tried again. I like this one better. I painted this plein air piece in full sun this afternoon after work. Standing in a cow pasture, I had one rather large cow that got pretty interested in what I was doing. She actually made me a bit nervous at one point, sneaking up behind me. Full grown cow, probably 1000 - 1200 lbs or so. I finally had to run her off. I knew this one would be darker than what I was seeing in the field, so tried to compensate a little while painting. Not much going on colorwise. Here's one I did today at Dale Hollow Lake State Resort Park. I used the board I wiped from yesterday afternoon's effort. This one took about an hour. As you can see, I simplified A LOT. A little study I'm happy with for the time being. Also including a couple of action shots and my set-up. The two pics above are Rylea Beth in action. The one below is her 5" x 7" acrylic plein air of my parents next door neighbor's house. Below is my earlier effort of the day. Got out before 7 o'clock this morning. The pic below that is of my fan club. They were so big they blocked my view. Just letting everyone know that I have a painting that's been accepted into the Richard Schmid Fine Art Auction to be held on September 6, 2009 in Rist Canyon, Colorado. The auction benefits the Rist Canyon Volunteer Fire Department. Here's today's effort. It was my birthday today. Had a great one. With some good news I'll share soon. Here's this evenings effort at plein air. What a beautiful afternoon to be outside painting. Including an early on pic to show the set-up and sketch. "Riddle Farm - Barn #1"
Here's a plein air piece I did this afternoon at Salem Park in Cumberland County, Kentucky. We've had so much rain lately that this normally calm creek is rolling. Here's tonight's effort. Really trying to capture light in my last few. Comments are always welcome. Here's a LINK to the ref of the courtyard painting found in the post below. Clicking on it will open Google Street View in the painting location. Here's a short demonstration of a painting I did tonight. I painted on linen mounted to masonite. The size if 9" x 12". I used both brushes and palette knife with this one. Above, you can see my toned support. Above, is my laying in of the darks with a palette knife. At this step I wanted establish the light of the painting. To me the focal point (can light be a focal point? ), and the most important element of the painting. Starting to lay in the backlit leaves and cooler areas. Working from back to front, building up each element along the way. Thanks for taking this short little detour with me. I had fun, and hope you did also. Did this one from Street View tonight. While working from a photo ref, I did try to give the feeling of being there. Hope my light came across as I intended. 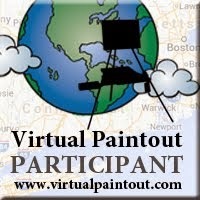 Here's one I did for the Virtual Paintout for May. It didn't photograph well at all. Top's not in focus, and the man looks washed out. He has more color in his face IRL, I promise. But here it is anyway. I did this one with mostly brushes, but did use the knife a little. * I re-uploaded these pics after painting the sign on the building. The building is called the Ship's Store, though it is sitting on a large lake for this area, there are hardly any ships here. Mostly houseboats and ski boats. Including a couple of pics of my set-up with the darks laid in on toned canvas.